The ‘Age of Romanticism’: Fact of Fiction? Historians have always had a tendency to invent and periodise paradigms, and picking the accurate labels is undoubtedly essential for synthesising history. The proposed ‘Age of Romanticism’ asserts the aesthetic’s dominance in Europe from the late 18th century to the late 19th century, but should it be adopted? Living in 19th century Europe was eventful, to say the least. The period saw some of the most radical social, political and economic upheavals in human history, so it is unsurprising that new aesthetic movements emerged to help the European populace cope with life’s new challenges. Romanticism is perhaps the best known aesthetic movement of the period, and historians have often argued that its dominance from in the late 18th and 19th centuries merits the epithet in question. However, in this Age of Romanticism, the degree to which Romanticism was truly the dominant European aesthetic is questionable. Its influence and homogeneity varied between art-forms, periods and locations, meaning the reality is much more complex than this label would have you believe. In terms of its origins, most historians argue that Jean-Jacques Rousseau was the first of the Romantics, and that the publication of his La Nouvelle Heloise marked the birth of a new aesthetic movement. According to Cranston, readers were so struck by what they read that they ‘began to forsake the rigid mores of a neo-classical…tradition to think and feel in new ways’. The Enlightenment had poured scorn on religion, but its Baconian empiricism was too dry and utilitarian to offer a satisfying alternative to the Catholic spirituality whose credibility it had chipped away at. It is within this context that Rousseau’s Romanticism, which was rich enough in emotional intensity to replace this lost faith with new excitements, grew in popularity over the course of the next century. Viewing Romanticism as a backlash against the Enlightenment rationalism of the 18th century allows us to identify the main aspects of the aesthetic. Whilst the Enlightenment looked to classical antiquity for inspiration, Romantics revived the unseen, supernatural world which medieval man had occupied, a trend perhaps best illustrated by the popularity of the Gothic novel. This distinction is connected to another important aspect of Romantic thought — naturalism. As Halstead puts it ‘nature, for some, became divinity itself’. Romantics were not interested in abstract universal laws, but in nature’s glorious diversity of detail and mystery. So, the core concepts that made up the Romantic aesthetic were an opposition to the rationalist understanding of the universe, an admiration for the Europe of medieval times, an obsession with nature and the supernatural, and a belief that purely rationalist explanations of reality were inadequate. This is the Romantic aesthetic that this article will discuss. Let us start with literary Romanticism. It emerged in different geographical regions of Europe at different times, with distinct traits, and with varying degrees of dominance, suggesting the movement was not as unified and homogenous as the phrase Age of Romanticism suggests. 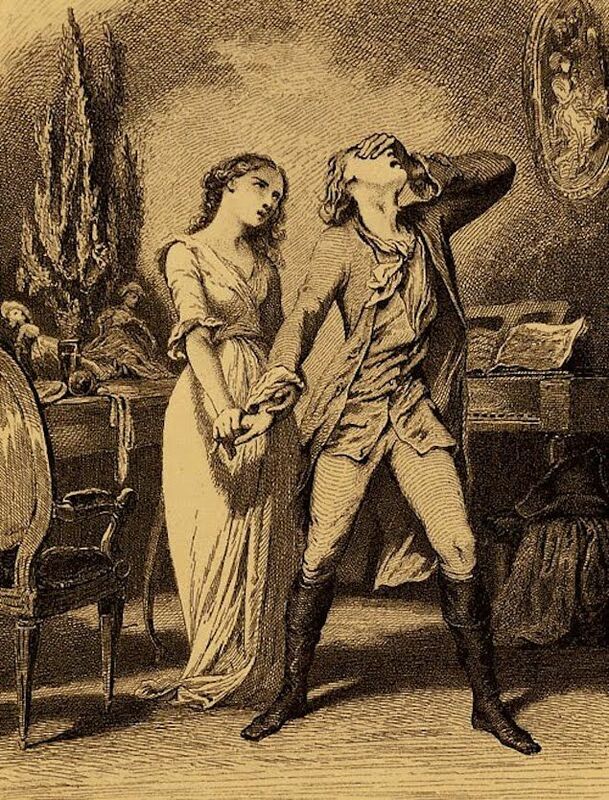 In Germany, arguably the birthplace of literary Romanticism, the aesthetic was popularised by Goethe’s loosely autobiographical novel The Sorrows of Young Werther. Wildly popular, it was reprinted some 50 times and was widely translated during the poet’s lifetime. The novel was part of a wider proto-Romantic movement in German literature known as Sturm und Drang, commonly translated to Storm and Stress. Werther exhibits some of the key Romantic themes we discussed earlier, most obviously when the protagonist commits suicide, preferring to die than to live without his love. Goethe consistently favours individual subjectivity and the freedom to express the extremes of emotion over the constraints of Enlightenment rationalism. The popularity of a movement which had at its core such anti-Enlightenment ideals represents a true break from tradition and suggests that the title Age of Romanticism may have been merited, in Germany at least. It should be noted, however, that Goethe eventually moved away from Romanticism and towards Weimar Classicism, suggesting that, even in its place of birth, literary Romanticism was by no means dominant. Romantic literature was much less homogenous in England than in Germany. In fact, the names we associate with English Romanticism — Blake, Wordsworth, Coleridge, Byron, Shelley — didn’t really see themselves as forming a single movement. Butler argues that the ‘present tendency of textbooks to insist on the resemblance of six major poets — Blake, Wordsworth, Coleridge, Byron, Shelley and Keats — dates only from about the 1940s’. Here we see the danger of historians retrospectively bunching together writers and slapping labels on periods in an effort to periodise and categorise; all sense of nuance is lost in the process. Butler also points out that, with the partial exception of Coleridge, ‘English creative writers were not in close touch with German literary men who did call themselves Romantics’. Any suggestion that Romanticism was some sort of pan-European phenomenon occurring simultaneously across the continent is deeply misguided. Unlike the literary sort, Romanticism in music was a much more homogenous and pan-European phenomenon and exhibited much more longevity than Romanticism in other art-forms. Prior to Romanticism’s ascendence, classicism was the dominant aesthetic movement in European music, with composers like Haydn and Mozart producing light, elegant, aristocratic and emotionally conserved sonatas and concertos. European composers gradually moved away from this style, becoming more emotionally expressive, less formal and less structured. They adopted less common musical structures like nocturnes, arabesques and rhapsodies, and they experimented with a wider range of notes and less structured harmonic progressions. Amongst the early Romantics, Truscott points to Schumann as a prime example of this change. His music, widely popular at the time, was heavily influenced by his ‘growing love for Clara Schumann and the desire, frustrated for so long, to marry her’. This openly sentimental and personal style of composition, and the innovative musical techniques that came with it, are symptomatic of the transition from a more reserved classical style to a more emotionally-oriented Romantic style of music. Wagner also exhibits Romantic themes in his aesthetic, including a fascination with the use of myth and legend as a source of profound truths about existence and an increasing obsession with the concept of the Volk — a sort of primitive communal soul— as an inspiration for true art. Again, much like other Romantics, his philosophies were grounded in history, specifically that of medieval Germany. His magnum opus, The Ring of Nibelungen, was produced in full only in 1876, by which time literary Romanticism had been superseded by Realism, illustrating how the chronological definition of the Age of Romanticism varies from art-form to art-form. Given music’s nature as a universal language of sorts that can cross national and linguistic boundaries with ease, especially when compared to literature, this homogeneity and longevity is perhaps unsurprising, again demonstrating how the definition of the Age of Romanticism and the degree to which it is an accurate descriptor depends on the art-form in question. By the 1860s, Romanticism was beginning to lose ground to new aesthetics in music and especially in art, mainly emerging from France. Chief amongst these was Impressionism. In contrast to Romanticism, Brettell describes Impressionist art as being ‘interested principally in the transcription of visual reality as it affects the retina of the painter within a discreet, short period of time’, focusing on the individual’s present experience, in contrast to Romanticism’s focus on the communal medieval past. This focus on contemporary life contrasts to Romanticism’s preference for historical or mythological scenes, and it was a preference for painting the contemporary, especially landscapes, that brought the first Impressionists together in the 1860s, eventually leading to the creation of the Anonymous Society of Artists in 1874. The movement became so widespread that, by the mid-1880s, every ambitious artist in the Euro-global world knew of the movement, and its effect on the practice of representation was virtually global by 1900. Impressionism was not limited to art either; Impressionist music began to grow in popularity in the 1880s and 1890s. Despite the fact that Debussy and Ravel shunned the label, their music was similar to Impressionist art in that it was focused on ‘conveying the moods and emotions aroused by the subject rather than a detailed tone‐picture’, an obvious example being Debussy’s La Mer, with its exotic scales, large unresolved 9th, 11th & 13th chords and lack of distinct harmonic structure. The fact that Impressionist music only began to gain popularity two decades after the emergence of Impressionism in art further underscores the point that, in different art-forms, aesthetic changes take place at different times. Furthermore, though Romanticism may have been dominant musically until the 1880s, it was already losing ground to new movements on other fronts in the 1860s, suggesting Romanticism was not dominant in all artistic fields simultaneously, even during the Age of Romanticism. The degree to which Romanticism was the dominant aesthetic in the late 18th and 19th centuries depends on the region and mode of art in question. Romanticism’s homogeneity, influence and aesthetic form varied widely from country to country and from art-form to art-form. Though there is no doubting the movement’s influence — it inspired Romantic literature and music of the highest order — Romanticism was by no means the dominant aesthetic movement in all art-forms in all regions of Europe at any given time, let alone throughout the whole of the so-called Age of Romanticism. Nice perspective. I hope this backlash never happens again. I would go for the period of enlightenment which we are soon in due. Yo have an interesting blog. Thanks for the follow!